A very nicely done map with support for both SP and DM, and one which I unfortunately haven't had the chance to play in a real Dukematch. 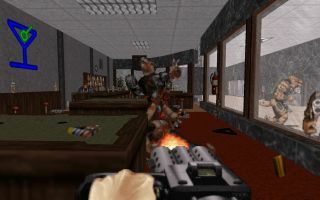 DukeMall is a large, extensive level requiring almost complete prior knowledge of the layout of the map - so if you DO want to use the 'big guns' in the mall itself in DM mode, it's probably wise to do a bit of peaceful exploring first ala single player mode. Playing with monsters on is, as the text file suggests, very much required to access the whole level, though as a result there's one particularly nasty bit where running for cover is by far the most intelligent option. Despite initial appearances, it is possible to unlock every door - and some judicious problem solving will answer the question of just what the hell to do with those pipebombs once you get them (applicable to DM only), unless you just want to use them to set up traps for your opponents. Outside the mall itself (yes you can get there) is a little underdetailed in comparison with inside, but if you're running around dodging RPGs that really ought not matter. The recently completed single player version of the map is almost like playing a different level, so if you've played it before it may well be worth checking out again. Gone is the pipebomb puzzle, in with the barricades and a newly renovated roof section which the aliens are just dying to get you to see. 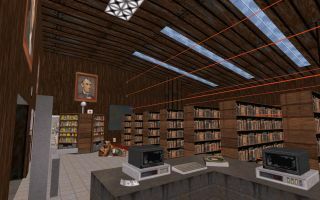 The beginning of the level also places you outside the mall, whereupon you work your way in, a complete inversion of the original DM version. In terms of design, the mall is now chopped up into sections and it's your job to navigate from one end to the other via the trusty, though convoluted duct system. Sounds painful, but it's been quite well done and isn't too confusing. After you've found your key card you've mostly exhausted the places in the mall to explore, so the map author has conveniently put in a monster trail for you to follow. Further fun and games ensue, till the big finale on the roof. As previously stated it's a long level; it took me the better part of three quarters of an hour to explore it and eliminate every last scum sucking algae eater. The author has put a lot of hard work into this - enjoy. For best results, turn word wrap ON and MAXIMIZE the window. THIS MAP IS NOT DESIGNED FOR THE HI-RES PACK. switch which will unlock elevator access to the roof. Single Player           : That would be the SP part of the title. Cooperative 2-8 Player	: Implemented. Haven't tried it. multiplayer needs (see further below). Difficulty Settings     : Oh yes. All 4 of them. Are YOU Damn Good? Atomic Edition Required : Quite. Build Time              : Almost a month on an inconsistent basis. problem solving, you can unlock the entire map and choose any area to battle. 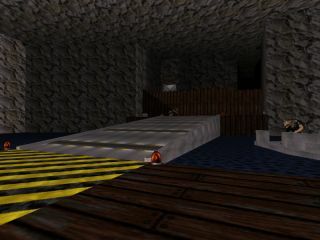 (monsters are REQUIRED to access the secret playable areas). 1.7, and erm... old computers? way the engine functions, it just can't be perfect. closet door (due to a clipping glitch). -Small arms projectile (shotsparks) are cut short by random clipping errors outside. sector is simply too large. absolutely no difference to gameplay. then running out the doors before it takes off. Pleading with it won't bring it back. screwed. You'll have to restart if you're trying to unlock the doors. learned how to deal with their own spinning walls yet. Squish! suggesting an idea which I have implemented. Provided I receive my due credit, you are free to do what you like with it. Page generated in 0.2457 seconds.